There are two types of revenue you'll find on your Schedule: collected and expected. Collected Revenue: This represents all of the actual invoice payments you’ve received from your clients. 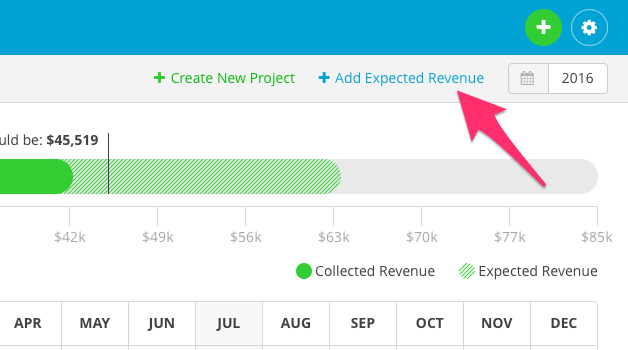 Collected revenue is represented by the solid green progress bar at the top of your Schedule (more about the progress bar in just a minute), and by the solid green circles within your Schedule’s calendar. Expected Revenue: This represents all of the revenue you expect to receive, but haven’t received yet. Expected revenue can be added to your Schedule manually, and also includes all of your outstanding invoices, and even Draft invoices. Expected revenue is represented by the striped green progress bar at the top of your Schedule, and by the striped green circles within your Schedule’s calendar. All of your outstanding and Draft invoices will automatically show up on your Schedule as expected revenue. For example, if you know when you're expected to get paid for your projects go ahead and create Draft invoices now, even before you send them to your clients. These Draft invoices will show up on your Schedule as expected revenue according to the due dates of the invoices. And when those invoices get paid your Schedule will automatically convert and display them as collected revenue. But invoices aren't the only way to add expected revenue to your Schedule. Let’s say you’re planning to work on a new client project next month and you want to see how the expected revenue from that project might affect your monthly and yearly goals. You don’t have the time or the details right now to create a future Draft invoice for the project. No problem. Instead you can simply use the “Add Expected Revenue” action found at the top of your Schedule. 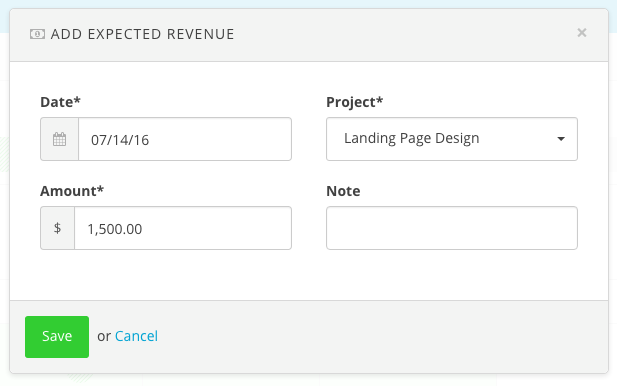 Clicking this action will trigger a new "Add Expected Revenue" form. Using this form you can quickly enter an estimated amount of expected revenue for any project and date. You can also add a note for future reference. 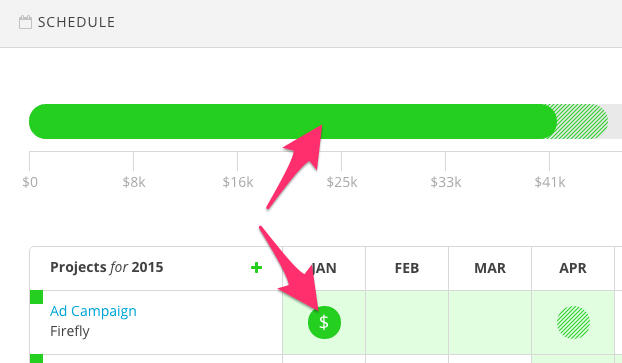 After clicking “Save” you’ll find your new expected revenue entry displayed on your Schedule. 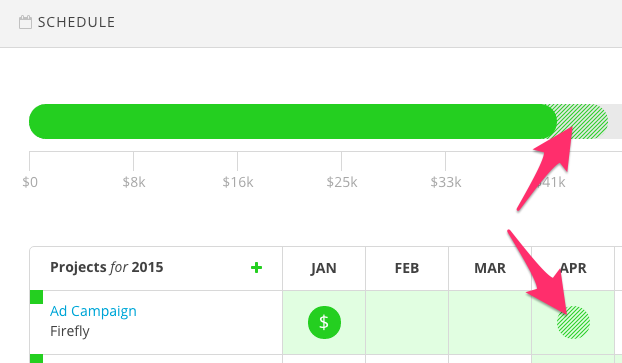 Tracking expected revenue on your Schedule allows you to see into the future. It turns your Schedule into a powerful forecasting tool. Note: But what about invoices that aren't associated with a project? Will they show up on the Schedule? Yes, when you receive payments for an invoice that isn’t associated with a project those payments will still show up on your Schedule. The payments will be displayed in a separate table row for the client labeled “Unknown Project.” This ensures that the total revenue displayed on your Schedule is always accurate. Note: If you need to record revenue in Harpoon that didn’t come from a client’s invoice payment you can always create an invoice for that source of revenue and record a payment on the invoice. For example, you might have a side project that isn’t client-related, but does make you some income (maybe a website that brings in advertising revenue). You could create an invoice each month for this source of revenue which would allow Harpoon to include your side project revenue as part of your overall business metrics. The bottom line is that if you want Harpoon to record your revenue it has to be in the form of an invoice payment.